Safe and easy Trolley Ride-on Luggage. Make travelling with kids a breeze using this Trolley Ride-on Luggage. The Lenoxx Trolley Ride-on Luggage helps take the stress out of travelling with children. The trolley makes airport transport with little ones simple, as your children can choose to pull their luggage with the fully adjustable tow strap and sit down when they need a break and be dragged along without having to use their feet. 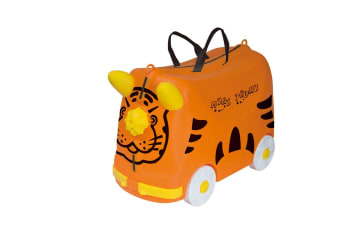 The safe and sturdy design horns on the front of the trolley will make this ride-on luggage perfect for holidays, weekend trips or even storing and moving toys around the house.